Say "Hello" to the newest Electionbuddy voting method: Scored! 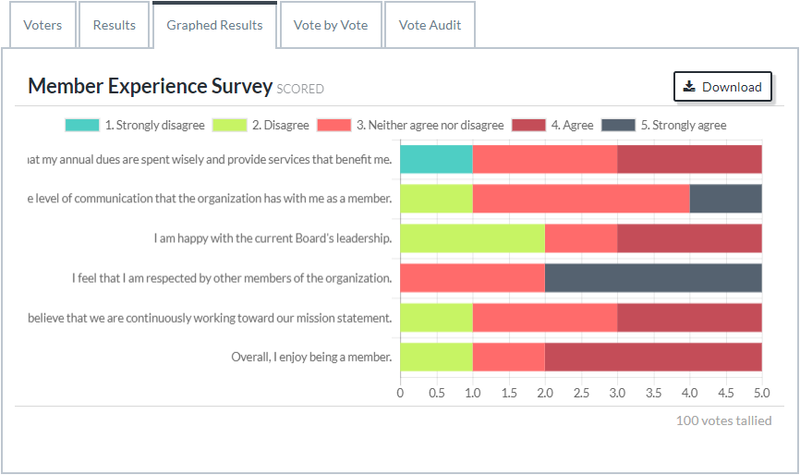 This voting method is called "Scored" in Electionbuddy, but this voting method is multi-faceted: it can be used to run an actual election (where a winner is elected), and can also be used to create a survey-style (i.e. a rating scale) question. 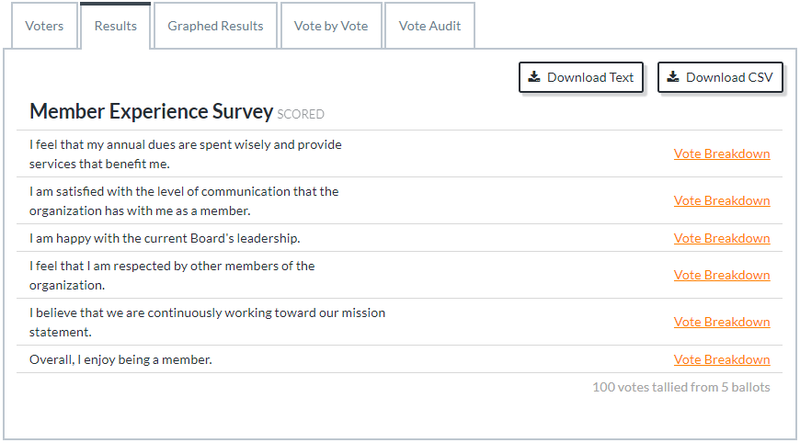 Below, we will explore how to create a survey with the "Scored" voting method. 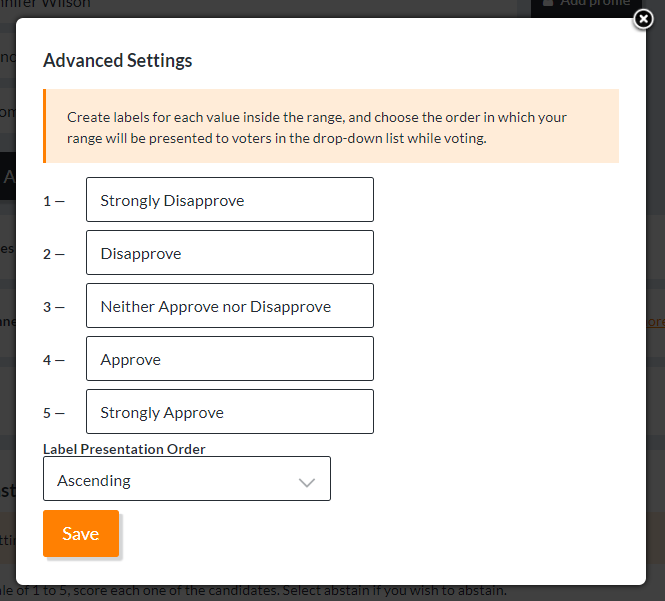 Create a new ballot question using the "+ Add position or question" button. This will populate a sample survey question. 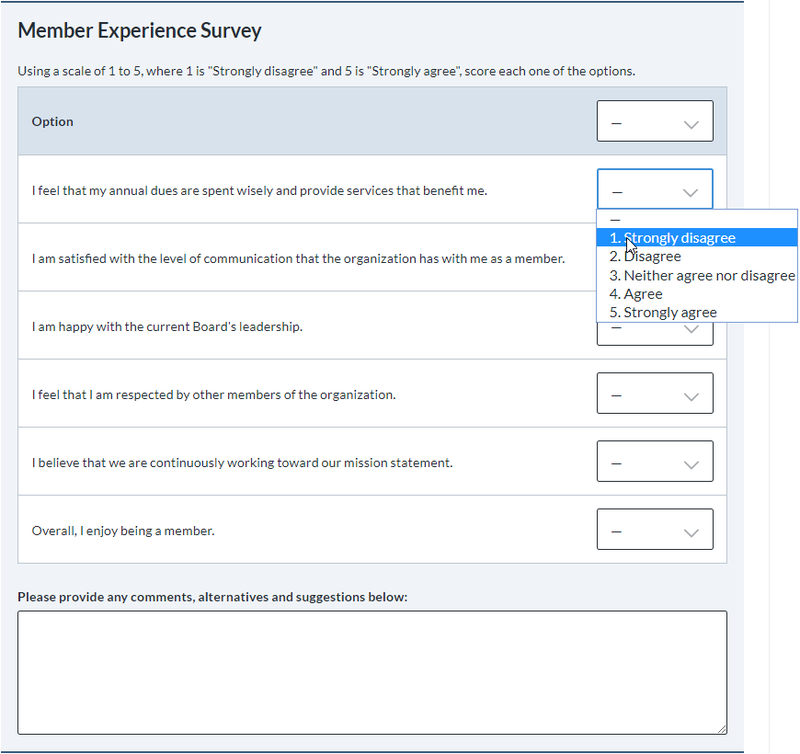 Feel free to change the text for the question title and question options; you can add more question options by clicking the "+ Add Option" button. First, you must create a range that your voters will be scoring on. In the above example, we are using a range of 1 to 5, but you can use any range. Only whole numbers will be accepted. Negative numbers can be used for your range. 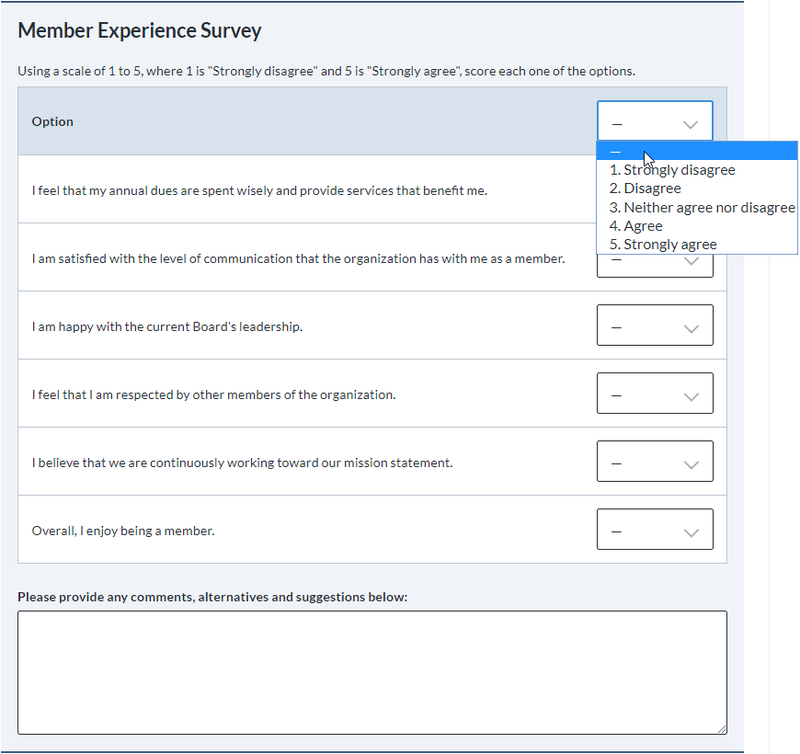 The sample survey question that is populated when you set up this question as described uses a scale of 1 to 5, which is standard for the Likert rating scale. After that, leave the setting for "Select Winner" in the "No — vote breakdown only" position. Electionbuddy will not choose a winner for you and instead will just give you a vote breakdown; see the "Results" section below for more details. If you change the setting to "Descending", the list would be ordered from 5 to 1 (the reverse of the above) instead. Add any further settings to the ballot (i.e. abstains, ask for comments, or random ordering), and add any additional voter instructions that you may want. Finish setting up any further items on your ballot, and proceed with setting up the rest of your election as normal. Voters simply assign a score to each candidate/option on the ballot by selecting the score from a drop-down list. All candidates/options must be scored (none can be left without a score). The same score can be assigned to multiple candidates/options. 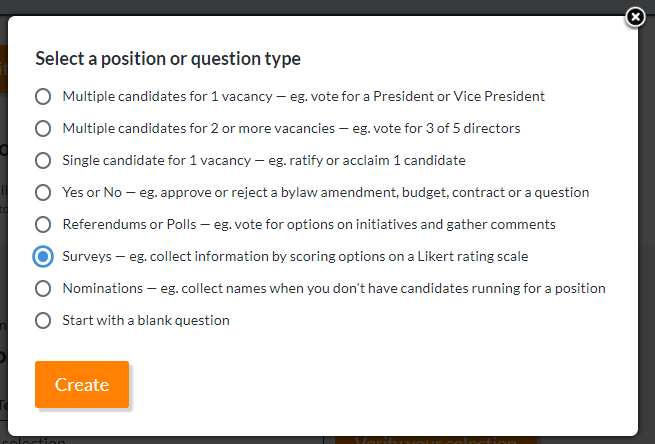 Using the top-most drop-down list, the voters can automatically assign the same score to all the candidates/options on the ballot. Weighting is compatible with the "Scored" voting method; weights will be reflected in the total scores. Taking a download of the results will provide you with the vote breakdown for each candidate.